Japanese Prime Minister Shinzo Abe asked British Prime Minister Theresa May at a news conference in London on Thursday what kind of meal she would be preparing for her husband tonight. “What are you cooking your husband for dinner?” Abe asked. May was taken aback by the question and assumed it must have been some kind of Japanese joke. 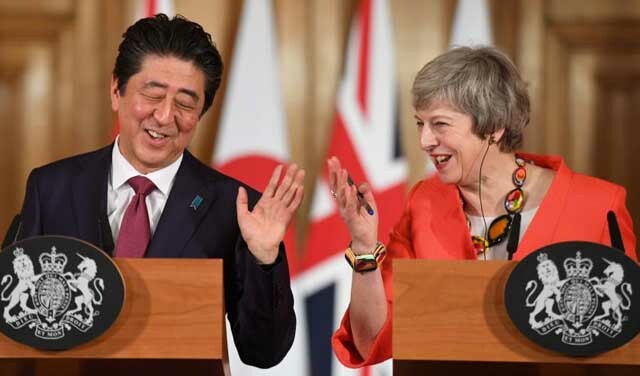 “Good Japanese joke,” May responded to Abe with a forced laugh. Abe was confused by May’s reaction and wondered when the real male leader of Britain was going to show up. “If she can’t have kids, what else can she do?” Abe thought.